"The Legend of Korra – Book Three: Change has arrived on Blu-ray and DVD just in time for the holidays. 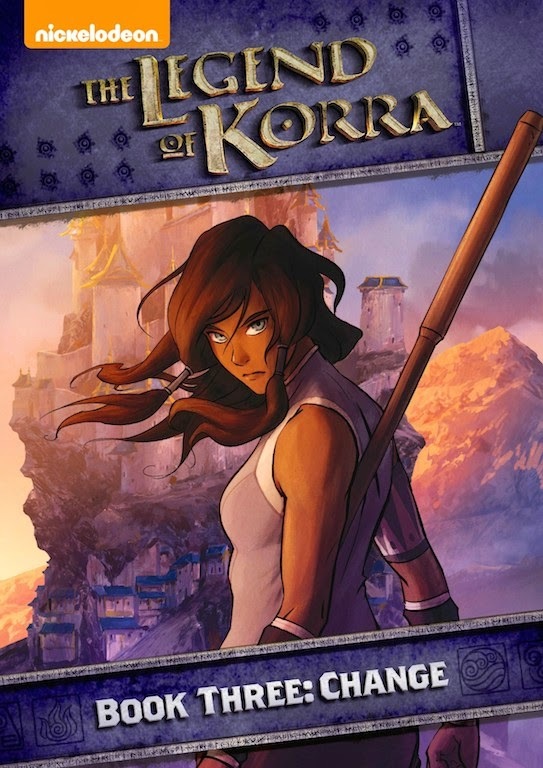 Book Three starts with the world entering a new age as Korra discovers that new Airbenders are popping up all over the Earth Kingdom, and she makes it her mission to find them and rebuild the Air Nation. But when a group of dangerous criminals break out of prison, they have a dangerous mission of their own! The series was voted as IGN’s Best TV Animated Series in 2012 and was the only animated series on the annual list of iTunes Best TV Shows of 2013. TheLegend of Korra – Book Three: Change Blu-ray and DVD, created by Nickelodeon Home Entertainment and distributed by Paramount Home Media Distribution, is now available. From the creators of Avatar: The Last Airbender comes an epic series that continues the exciting adventures of element bending. The time of Aang the last Airbender has passed, but the spirit of the Avatar lives on in Korra. In Book One: Air, Avatar Korra struggles to fight an anti-bender movement led by the mysterious masked leader, Amon. In Book Two: Spirits,Korra and Team Avatar embark on a new journey deep into the mythology of the mystical Spirit World to defeat a dark spirit once and for all. Now, as the world enters a new age where Spirit and mankind live together, Book Three: Change, reveals the exciting return of the Airbenders! But while Korra makes it her mission to find them and rebuild the Air Nation, a group of dangerous criminals embark on a mission of their own!" I love when I can have my niece and nephew help with a review, as they always see my girls helping and wish they could be included. So, when I heard that Paramount Home Media and Nickelodeon were releasing Book Three of the hit animated series, The Legend of Korra, on blu-ray and DVD the other day, I knew that this would be perfect for them, as they are both huge fans of the show. In addition to the 13 full length episodes that make up Book Three, this new release also contains 4 "The Spirit of an Episode" featurettes that my niece and nephew ended up watching first and loved. If you are not familiar with this Nickelodeon show, which is also huge online across digital platforms, this is an extension of "Avatar: The Last Airbender" which continues the story legendary story. What was so great about Book Three and its 13 episodes was the new characters and story lines fans of the show were introduced to. I sat down with my niece and nephew to watch a few episodes and couldn't pay attention, as they were talking my ear off about what was going to happen next and what I had missed in the previous two books. But, when I finally was able to watch an episode, I could see why they and so many others love this show and why the show has a growing fan base. I also love seeing a girl in lead role -- in this case, it is Korra, who is making it her mission to rebuild the Air Mission. It is hard to find animated shows like this in which there are girls in the cast, let alone a lead role. Even though my girls are too young to watch this show, I love knowing that there are shows like this on Nickelodeon and available to own to DVD and Blu-ray that I can share with my niece, and watch as she really gets into it and loves to talk about the show like she does. If you have a "The Legend of Korra" fan in your house and are still looking for gifts to pick up for the holidays, why not consider purchasing this new release, which is available on both Blu-ray and DVD, to surprise them with? Nickelodeon, now in its 35th year, is the number-one entertainment brand for kids. It has built a diverse, global business by putting kids first in everything it does. The company includes television programming and production in the United States and around the world, plus consumer products, online, recreation, books and feature films. Nickelodeon’s U.S. television network is seen in almost 100 million households and has been the number-one-rated basic cable network for 19 consecutive years. Nickelodeon and all related titles, characters and logos are trademarks of Viacom Inc. (NYSE: VIA, VIA.B).